Let’s take a 4-pack of typical Dividend Aristocrats and map how much they’ll pay investors (based on that $470K nest egg I mentioned earlier) in the next few months. 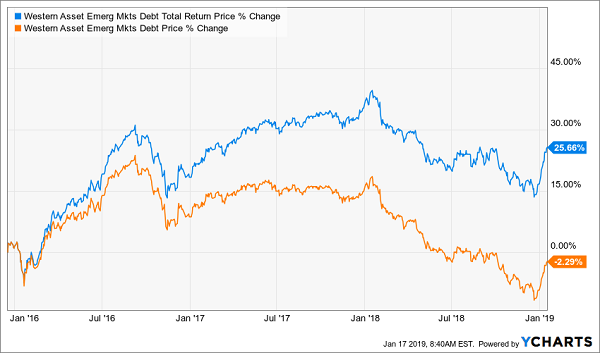 The Western Asset Emerging Markets Debt Fund (EMD) yields a gaudy 9.1% today and trades at a 13.1% discount to NAV as I write. Now let’s come back home to another sector primed for gains thanks to slowing rate hikes: US real estate. We’ll ride that trend with the Cohen & Steers Total Return Realty Fund (RQI), and its 8.5% monthly dividend. 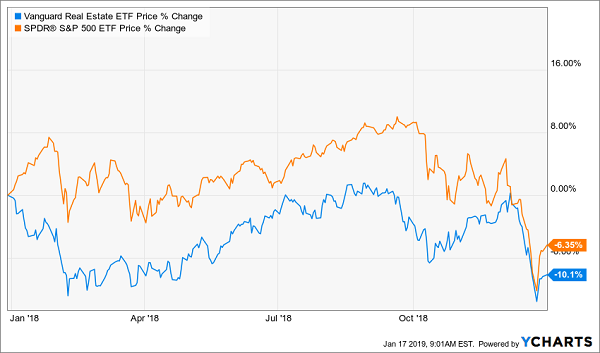 But I sensed that the Fed was about to change tack during last fall’s stock-market meltdown, which is why I pounded the table on RQI on December 28. 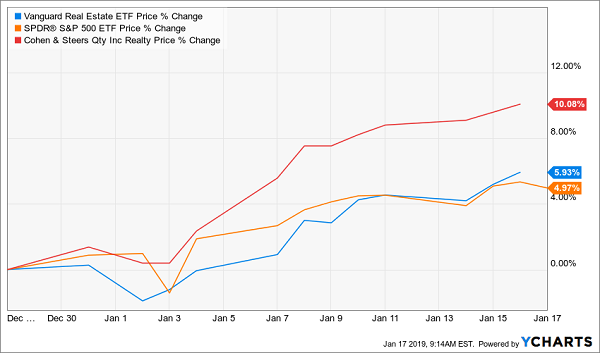 Since then, the CEF (in red below) has dominated the benchmark Vanguard Real Estate ETF (VNQ), in blue, and the SPDR S&P 500 ETF (SPY), in orange. 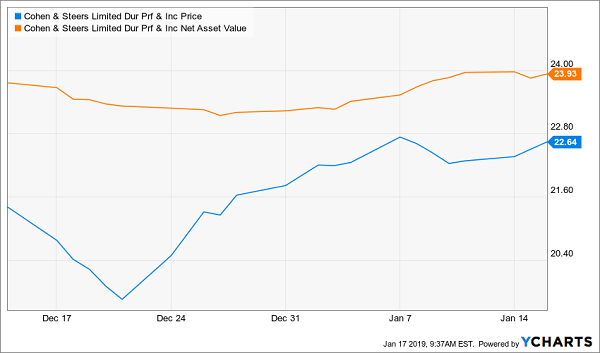 Sure, that rise has thinned RQI’s discount, but you’re still getting an 8.5% payout here, and the current discount (8.7%) points to more upside: just under a year ago, RQI traded at just 1% below NAV. A rise to that level (a certainty, in my view) would give us a 6% price gain while we pocket that huge payout. Moving along, let’s add some top-quality finance names through another CEF from Cohen & Steers: the Cohen & Steers Limited Duration Preferred & Income Fund (LDP). Their biggest appeal? Outsized payouts. And you can boost those dividends even more if you buy through a CEF like LDP, which pays an outsized 8.3% now. 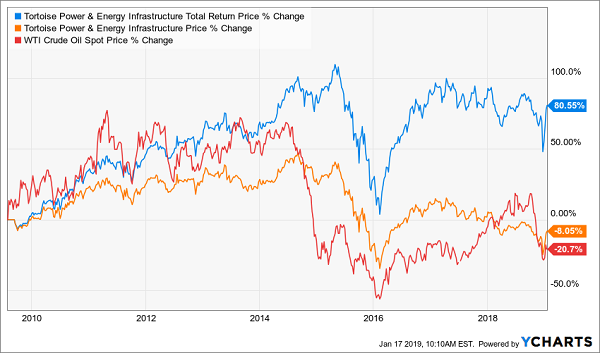 Finally, let’s tap the Tortoise Power & Energy Infrastructure Fund (TPZ) for its 8.1% payout, while we can still do so at a 7.8% discount. Below we can see that TPZ’s market price (orange) has dipped 8.1% since launch, but that’s way better than the goo’s 21% crash (in red). And when you add in TPZ’s big dividend, you can see that management has handed investors a solid 81% return in just under a decade. Oil Crash? What Oil Crash? If you’ve read this far, I’m guessing you’re keen to add at least one or two rock-solid monthly payers to your portfolio. 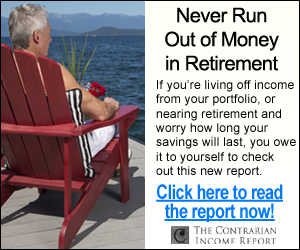 Take the 20 stocks in my Contrarian Income Report portfolio. As I write, these 20 cash machines pay an average 7.6% dividend yield! And best of all, nine pay send out cash dividends every single month! I can’t wait to share all my research on these rock-solid monthly retirement plays with you. 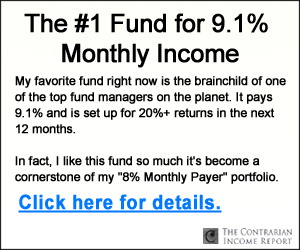 Click here and I’ll reveal all 20 of the 7.6%+ payers in my portfolio, my 3 very best monthly payers to buy now and my complete monthly income strategy.